Picture the scene. You’re at the airport, safely nestled in the VIP lounge, away from the hustle and bustle of the crowds. The seats are comfortable, the atmosphere tranquil, and the service attentive. Eventually, you hear the final boarding call, and you’re forced to leave the relaxing and luxurious environment to board the aircraft. But what if you didn’t have to leave the lounge at all? Enter the Boeing 777x. The latest creation from one of aviation’s most iconic and successful brands is looking to redefine aircraft luxury. And it looks like they might just pull it off. The Boeing 777x isn’t your average aircraft. It’s an all-in-one flying device, home away from home, and entertainment center. 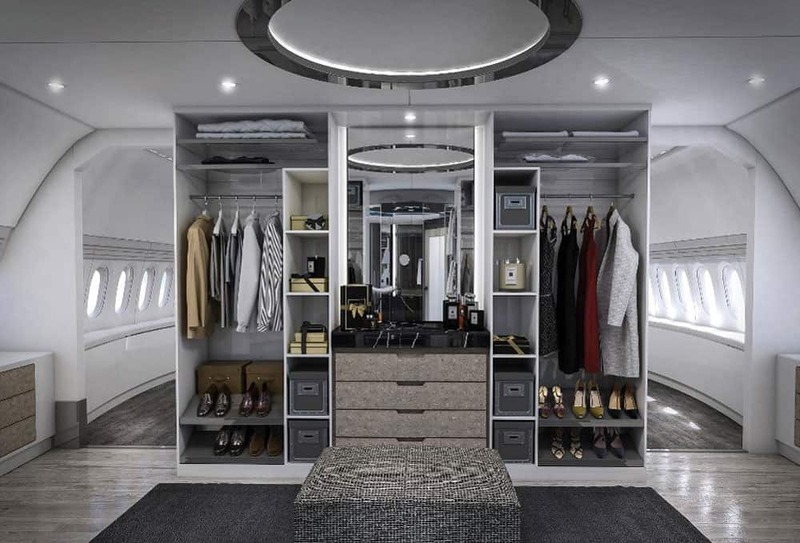 Luxurious features in private jets are nothing new, and these days many aircraft will come with perks that were previously unimaginable. 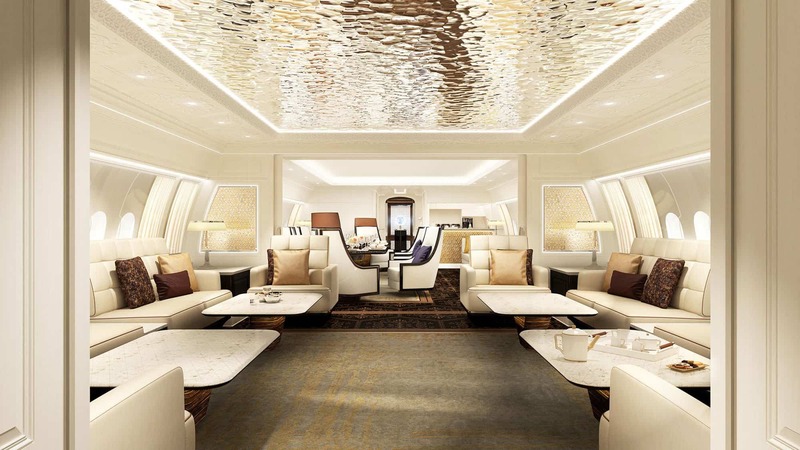 But the Boeing 777x takes this to the next level and genuinely gives the impression you’re walking around a high-end property, not an aircraft. Want to understand what we mean? The layout of the aircraft is a good place to start. There are multiple lounges dotted about the aircraft, but that’s just the beginning. You’ll also find a games room to help pass the time, and a full-blown cinema. Gone are the days of prepping your laptop with entertainment ahead of a long flight. Even the finest of private aircraft may require you to stoop a little, but not here. The ceilings are huge, stretching 8ft tall and even affording enough room for a walk-in wardrobe in the master suite. So, once you’ve watched a film at the cinema, you can produce your own fashion show. 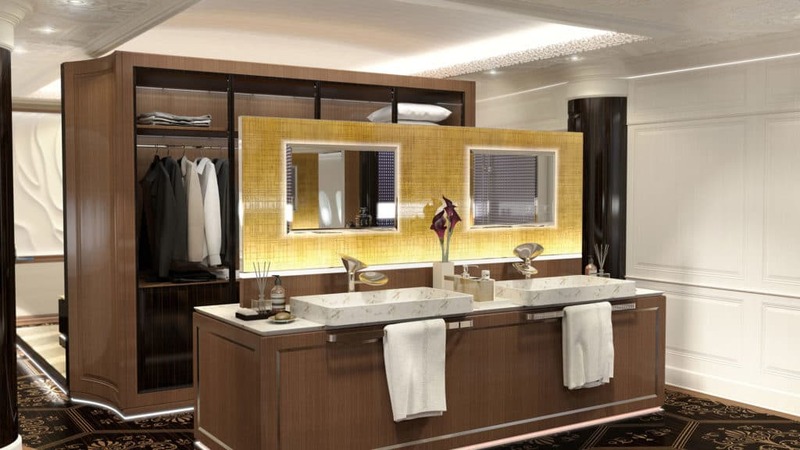 Speaking of the master suite, the interiors here are not just thrown together on a whim. 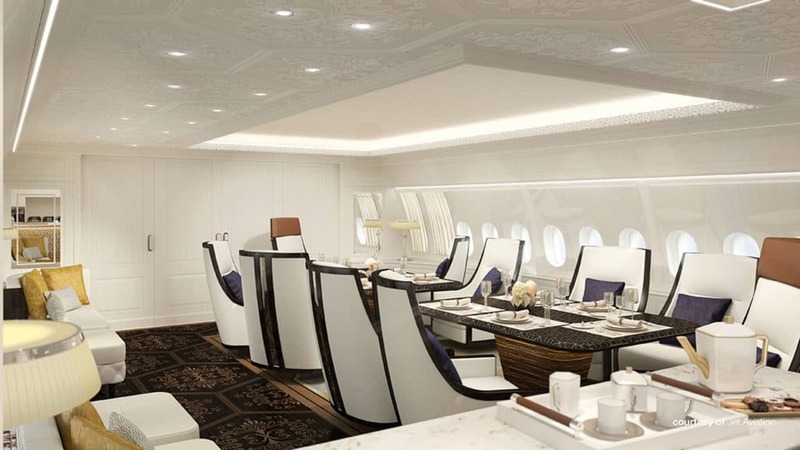 Boeing spared no expense in grouping together the best minds behind interior design experts Jet Aviation, Greenpoint Technologies and Unique Aircraft. The result? Sleek designs, matching colours, and fashionable furniture that really hits the sweet spot. After such a busy day of activities, you might want to freshen up. 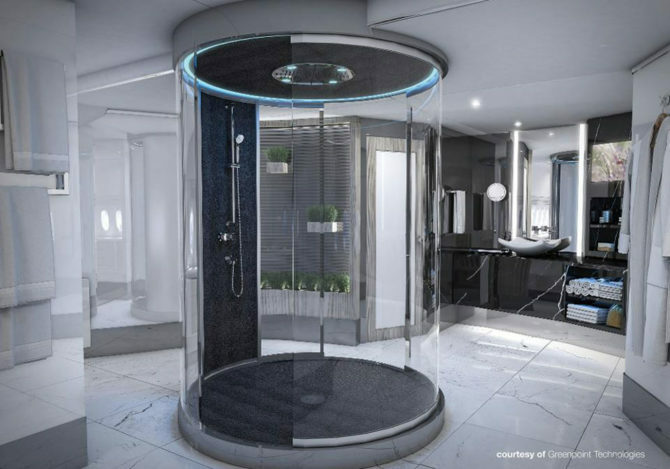 And where better to do so that your own glass steam shower, in a beautiful cylindric design complete with atmospheric blue light. Or, if that’s not quite luxurious enough, you can always check out the sealed Turkish bath. It’s clear the interior of the aircraft is spectacular. But does the outside have anything special to offer? Well, yes. Assuming you find folding wings impressive. That’s right. Despite its incredible size, depth and range, the carbon-fiber wings of the Boeing 777x achieve what the Airbus A380 has strived for. Because the tips of the wings can fold, the aircraft can be labelled as ICAO code E. Aside from other benefits such as reduced thrust and more efficient use of fuel, this also gives it a bigger leeway to land on code E runways without having to seek special approval first. From a technical perspective, the Boeing 777x fires on all cylinders. With a stunning range of 13,400 miles, it’s the longest in history. You can literally fly from one side of the world to the other, non-stop. It’s engines – custom-built for the Boeing 777x – are the most fuel efficient ever created for an aircraft of its type. And both the windows and cabin are larger than those of the aircraft’s inspiration, the 787 Dreamliner. In every imaginable way, the Boeing 777x outperforms its predecessors and peers. Even without considering the incredible wings and performance, you don’t have to be an aviation expert to see the appeal of an aircraft this luxurious. But will the price tag deter potential suitors? If the early orders are a sign of things to come, the answer is a resounding ‘no’. To get your hands on one of the prestigious models, you’ll need to invest a massive $400 million. On top of that, the company is currently planning to produce just 21 per year. But despite this, orders have already sold out ahead of its proposed launch. If you want to get involved, you’ll unfortunately have to join the back of the queue. That the nine-figure price tag hasn’t relinquished interest in the aircraft speaks volumes about its capabilities. And we won’t have to wait that long until its potential becomes a reality; Boeing is expecting the model to take to the skies this year. book filled to the brim. Things are looking promising. The Boeing 777x has huge expectations and will form a big part of what is shaping up to be an exciting year for the company. As well as working on this ground-breaking aircraft, Boeing is also teaming up with Embraer for a joint venture. Following a leak back in October 2018, Embraer officially unveiled its intentions to join forces with Boeing in a move that would redefine the industry. This follows on from new in July 2018 that Boeing aimed to acquire 80% of Embraer’s commercial arm – a move valued at $4.75 billion. Or, to put it another way, the cost of around 12 Boeing 777x. It’s a move that spells safety for Embraer, and an increased stronghold for Boeing. Combined with an aircraft the likes of which has never been seen before, 2019 is certainly shaping up to be a very interesting year for Boeing. We can’t wait to see what happens. Pictures courtesy of Jet Aviation and Greenpoint Technologies.